No El Paso area business wants to worry about waste disposal – which is why El Paso Disposal is dedicated to providing worry-free commercial trash and recycling service that’s tailored to your firm’s needs. Our local commercial waste service professionals are standing by to help you determine the right size front-loading containers and frequency of service – to fit the needs of your business and your budget. 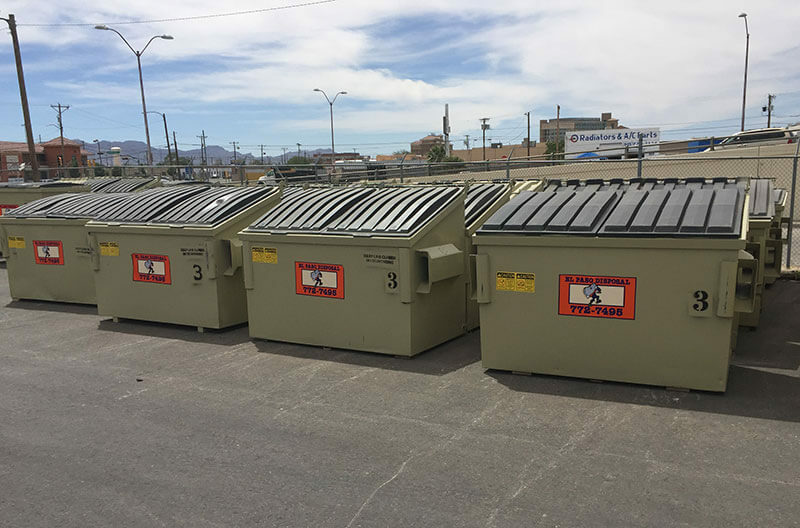 We’ll also work with you to choose the ideal location for your El Paso commercial trash containers and help you design trouble-free enclosures. Our sister company, Southwest Disposal, provides residential and commercial service to many southern New Mexico communities, including Cloudcroft, Hatch, Alamagordo, Doña Ana County and Roswell. 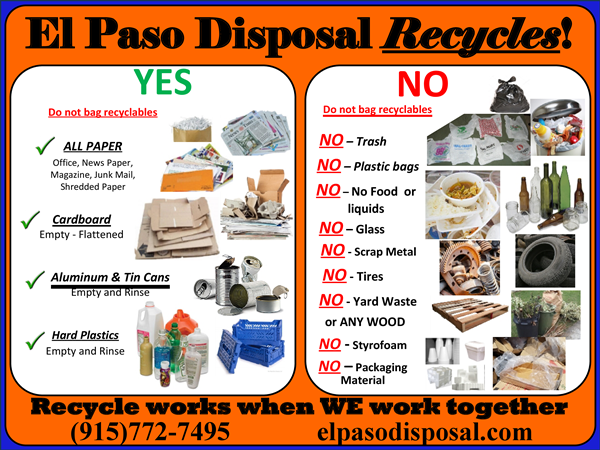 El Paso Disposal offers containers ranging from a 2 cubic yard dumpster to an 8 cubic yard dumpster. Our recommendations are based on the amount of waste typically generated by your business. In tailoring your El Paso area commercial waste removal service, we rely industry standards and our professional knowledge gained by servicing thousands of other El Paso area commercial waste customers. 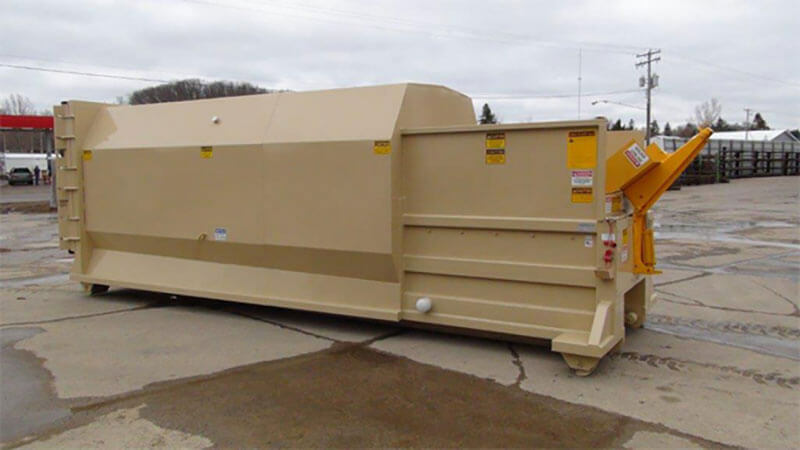 El Paso Disposal provides the following range of front-loader containers to suit your commercial waste disposal needs. One cubic yard is equal to four 55-gallon drums, or seven 30-gallon garbage cans. All El Paso Disposal containers are 84” wide including pockets. For safety, environmental or legal reasons some waste materials are not allowed in any El Paso Disposal front-loading trash and recycling container. If your business generates a high volume of compactible solid waste – like that of a hotel or grocery store - an El Paso Disposal compactor unit can help you save space, reduce pickup frequency and cut your commercial waste collection costs. In fact, depending on the materials, a compactor from El Paso Disposal can reduce your volume of waste by up to 80% with minimal handling. That means a single unit can hold up to 400 cubic yards before compaction – that would take a pickup truck up to 200 trips to remove! Please call 915-772-7600 for Commercial Waste Compactor service. El Paso Disposal can provide cart dumpsters, through-the-wall chutes, hoppers for dock loading, “dog houses” with security locks, insect and animal control devices and full-container indicators. El Paso Dispoal commercial trash and recycling customers are billed on the first of every month. Payments to El Paso Disposal are due on the 20th of the same month.